I would like to hear what is the usual outcome after what just happened to me. I had multiple entrances social visit visa and I came to Malaysia in October first time. Stayed 30 days, went to Thailand and stayed 30 days there, came back to Malaysia and stayed around 25 more days. After that I tried to go to Singapore, and I won't lie, I would probably try to stay 3-4 days there and come back one more time to Malaysia (2 days before my visa validity period expires) and get 30 more days to stay in Malaysia. I guess this is not acceptable for some reason and even though no one explicitly accused me of trying to do this, they hinted it at Singapore borders and rejected my entrance. 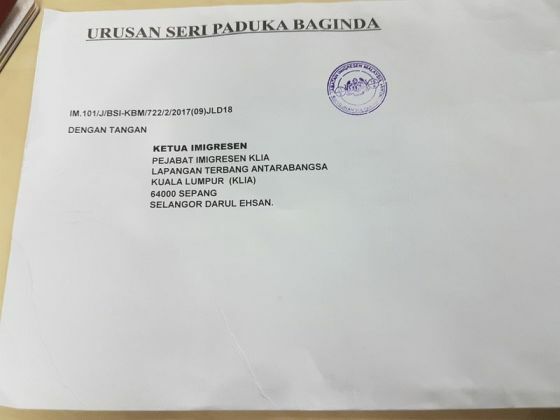 They gave me a letter that I had to show to Malaysian immigration officer and sent me back to them. 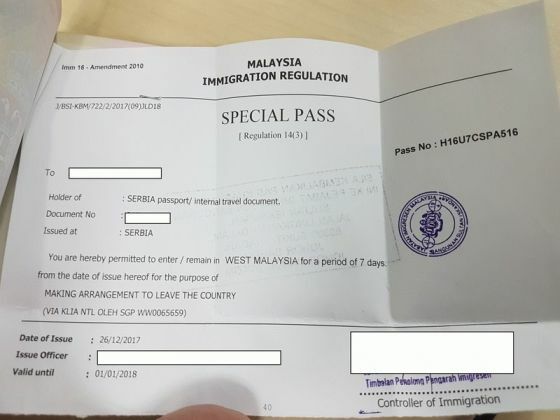 Malaysian immigration officer then gave me a special pass instead of 30 days social pass, and gave me a week time to leave the country, by 1 January 2018. I got some sealed letter and some special pass note attached in passport along with special pass stamped in passport. So far I didn't break any law, overstayed, paid any fine or anything similar. Do you think they will put me on blacklist when I try to leave the country? 1. What are you doing for so long in Malaysia? Looking for jobs? 2. Where did you fly from into Malaysia the first time? Siberia? 3. The sealed letter was addressed to whom? 4. How are you going out from Malaysia and to where? Have you purchased the air ticket? Have you checked in yet? Have you printed the boarding ticket? 5. The blacklisting could be coded in the boarding pass. Post a copy here for checking. 6. Any blacklisting will be done at the immigration counter at the airport. Hello Jeff, thank you for your reply. No, visiting friends. I have childhood friends in Thailand and Malaysia and I decided to spend some time with them. One of them is actually getting married on 1st January and I'm still not sure if I should attend it for few hours before the flight. I'm flying back to my country. I purchased the ticket yesterday for the 1st of January. Checking is possible only 24 hours before the flight. Don't have boarding pass yet. Oops.. did I write Siberia? I meant Serbia actually as your this ID suggests. 1. Attend the wedding ceremony in the morning. Be sure to allow 4 hours to clear immigration for the evening flight. It is Jan 1st could be very very crowded. Remember, you may have immigration issues. 2. You have been crossing multiple borders which is not so easy unlike 5 years ago. 3. Did Singapore Immigration stamp anything on your passport? 4. Personally I do not think there would be any blacklisting for your case from Malaysian Immigration, but they may grill you like nobody's business if you try to enter within a short period. Since you are still here, get the original wedding invitation card from your friend to back up your current visit. In your next visit, have with you sufficient funds, invitations from friends and an itinerary to back you up. In your next visit, go visit Thailand first, enter by land border crossing into Malaysia then exit Malaysia by air direct back to your country. Do not attempt too may cross borders by air or by land. Hello Jeff and thank you again for your reply. So there might be issues at the Immigration? I was hoping that they will just do whatever they do at the counter and let me go back to my country. You think they would take me for questioning perhaps? What's the worse that can happen? I don't think I will attend the wedding, I think I will rather go to the airport 10 hours before the flight just in case. I see that now and I doubt I will ever stay more than one month per country in future. 4. Since you are still here, get the original wedding invitation card from your friend to back up your current visit. In your next visit, have with you sufficient funds, invitations from friends and an itinerary to back you up. In your next visit, go visit Thailand first, enter by land border crossing into Malaysia then exit Malaysia by air direct back to your country. Do not attempt too may cross borders by air or by land. Will do, and thank you for your advices, you have been most helpful. Okay, with these sets of docs, there will be no issues with Airport Immigration at KLIA. There will be no blacklisting of any kind. At Singapore Woodlands Immigration, they have given you a NTL without stamping on your passport which is very lucky. There is a NTL number. You may have given some wrong excuses to enter Singapore. 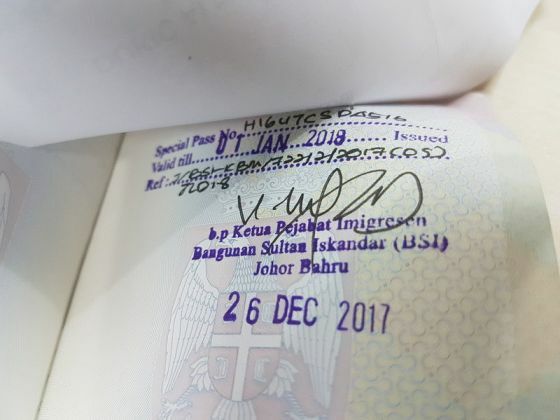 Since you have entered Malaysia twice and had stayed near max duration, Immigration Johor Baru has decided not to allow you further Social Visit Pass of 30 days instead give you a free special pass to exit within 7 days. Because of this "need not pay special pass" they have to issue a letter to Immigration at KLIA for you to exit and stamped a special pass on your passport. This is different from the "exit pass" which I always mentioned in this forum for overstaying. With your pics now, I understand how faked agents used the word "special pass" wantonly to cheat foreign workers. Thank you. There is no further questions from Immigration at KLIA. You will just breeze thru the Immigration. You can go for attendance for your friend's wedding. Your situation is clear cut with these docs. On a hindsight, it is actually a blessing in disguise. If Singapore had let you in, you may not be able to enter Malaysia after that. Now they have no choice but to let you in to get you out. No need 10 hours early, just be at airport 4 hours early. The check-in counter (baggage) opens 3 hours before departure. Thank you so much Jeff for your help and detailed replies. I feel much better now. And what you said about blessing in disguise is among the lines of what Singaporean officer said. He said even if we let you in, Malaysians will not let you go back and you will be in problems. He said he will do me a favor and will give me a letter after which Malaysians will have to let me in and everything will be okay. I was almost sure he was bsing me a bit, but now you confirmed that he was telling the truth and was really doing me a favor. Hai to my first Serbian friend. Bon Voyage & Safe Journey Home. Any immigration issues at the KLIA? Thank you again for everything and Happy New Year to you too . Everything was as you said, no issues at all. Officer at the counter read the letter and didn't ask anything, just let me go. He came back after 1 month period. Welcome to Malaysia again! It really makes my day. Two good news at the same time!